Bald Eagle Release – Nearby! – On Thursday, August 2. You’re Invited! One of my favorite things is to see the Wildlife Center of Virginia release an animal back to the wild. To see an animal – whether a chipmunk, an owl, a bobcat, or a bear – get a second chance, thanks to the kindness of a rescuer and the skills of the Wildlife Center fills my heart with happy. Attending a Bald Eagle release, in person, is especially wonderful. It will take your breath away. But, because of their habitat, eagle releases are often at spots in Virginia that are a two- or three-hour drive away from us. This week’s release is nearby, Madison and Orange friends! 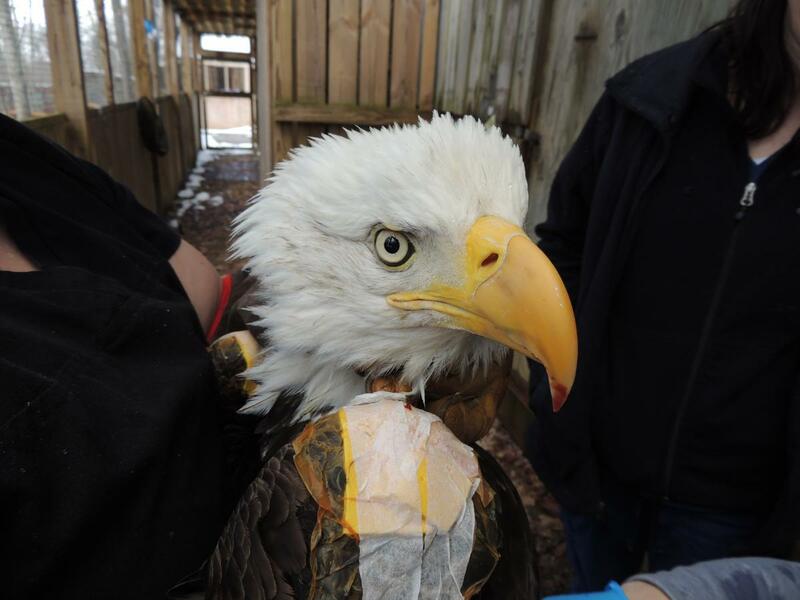 The Wildlife Center’s Bald Eagle Patient #18-0132 will be released on Thursday, August 2 at Walnut Creek Park [4250 Walnut Creek Park Road, North Garden, VA 22959] just outside of Charlottesville, Virginia. The release is open to the public and Center President Ed Clark will release the eagle at 12 noon. Those attending the release should meet at the beach/swimming area pavilion. The Albemarle Parks and Recreation Department has graciously waived the admission fee to Walnut Creek for eagle-release attendees. When you arrive at the park, please let front-gate personnel know that you’ll be attending the release. Bald Eagle Patient #18-0132 is an adult female who was found by a citizen on the side of an Albemarle County road in March. She was likely hit by a car and had internal injuries, a cracked talon, and infected wounds. You can read her entire patient history here. I’ve had the chance to attend a few eagle releases over the years, and every single one makes me cry. Because it’s such a privilege to not only see a beautiful eagle up close, but to see it fly off for another chance in the wild. It’s just extraordinary. The Peaceful Hands family has given so much to the Wildlife Center over the years – you’ve collected clover, pumpkins, and garden greens; donated food and supplies; and bought the largest collection of Wildlife Center tee-shirts of any Yoga studio anywhere! You deserve to see an eagle set free. You really do. I hope you can attend. And, if you can, please send a quick RSVP to rsvp@wildlifecenter.org. There’s no fee to attend, but it’s helpful for the Center to know how many they are expecting. This entry was posted in Wildlife Center and tagged Bald Eagles, Wildlife Center of Virginia by Jackie, The Baseball Bloggess. Bookmark the permalink.